It’s Friday and I have a yummy chocolate recipe on the way. What could be better? 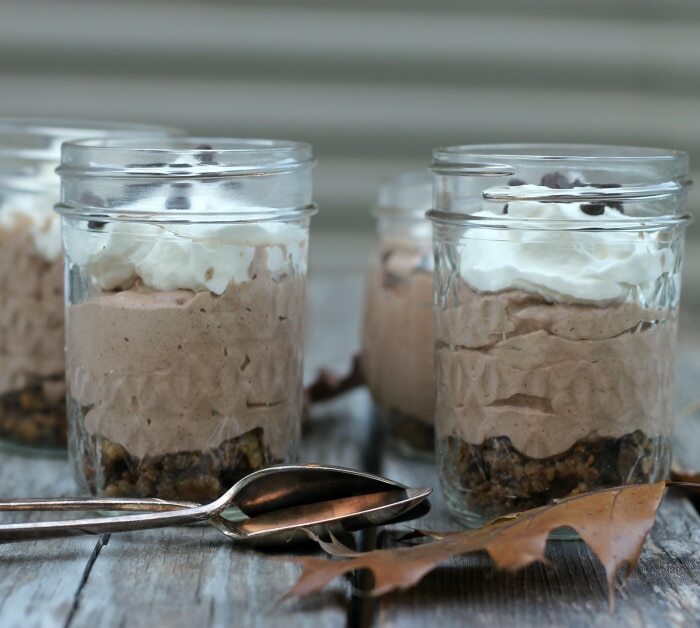 Not a lot of I can think of… I hope you enjoy these chocolate cheesecake mousses in a single serving recipe. I am talking about how much I love chocolate, which I do. But I was looking around my blog and I noticed that I haven’t featured a chocolate recipe in quite a while. So I decided that it was high time to feature something that is full of chocolate goodness. Also I had a lot of the family around, so I knew that most of this dessert would be eaten before they left. Yeah, even though I do love my chocolate I try not to eat too much of it. You know it likes to go straight to the hips. This was a dessert that my daughter Krista and I worked on together. We had mentioned the word dessert to the rest of the family and we were told that chocolate cheese cake would be appreciated. I thought it would be fun to go with individual desserts, so I brought up some of my jelly jars from the basement to use for that purpose. I didn’t have graham crackers for the base of the dessert, but I did have chocolate chip cookies in the house, so I used the cookies for the base. I was told that it was a good choice. 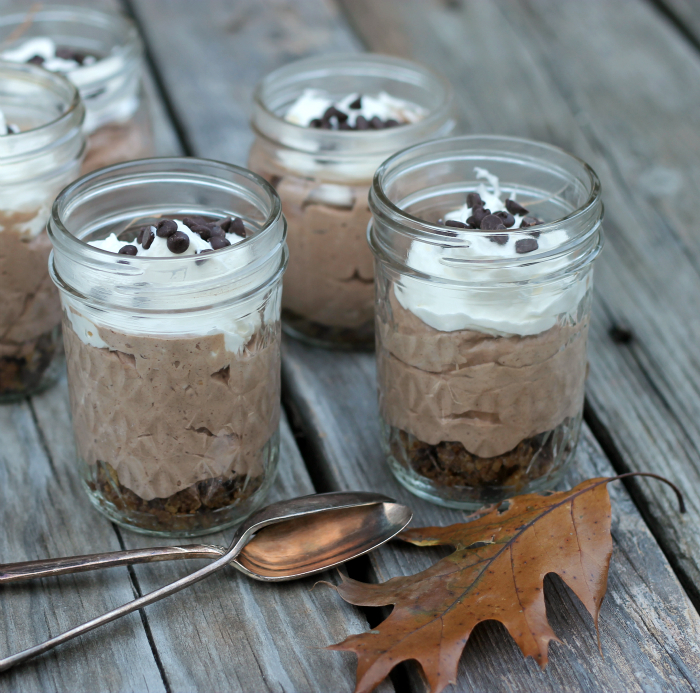 The dessert is a no bake chocolate cheesecake mousse, so it whips in a hurry. The cream cheese and the whipping cream make for a smooth and creamy filling. In a small bowl add the crushed chocolate chip cookies and melted butter. Mix until well blended. Divided evenly between the jars, glasses, or other containers. Press the cookie base into the bottom of the jar. (I used a whisk that had a larger bottom to press the crust down). Set aside. Melt the chocolate chips in the microwave making sure to do it in short spurts, mixing the chip in between each spurt, until melted. Set aside to cool. For the filling whip the cream cheese with an electric mixer until it is fluffy. Add the heavy whipping cream to another medium bowl and whip until stiff peaks form. Add the whipped cream to the cream cheese and mix in. Add the cooled chocolate and mix in. Add the powder sugar and mix in, add the vanilla and mix in until well blended. Divide evenly into the glass jars. Top with sweetened whipped cream and mini chocolate chips or whatever you prefer. I love that these are like cheesecake but require no baking. Yay! So single serving jars look super cute. Very, very nice. Dawn. Very nice. I love single pot desserts. I’ve never made cheesecake mousse, but I wanted for a long time. I always forget about it. Cheesecake is my favorite dessert. Looks delicious! These are making me weak on the knees! Two of my favorite things-chocolate and cheesecake-in one bite! Thanks for sharing. They look so beautiful and tempting! I love the individual serving. 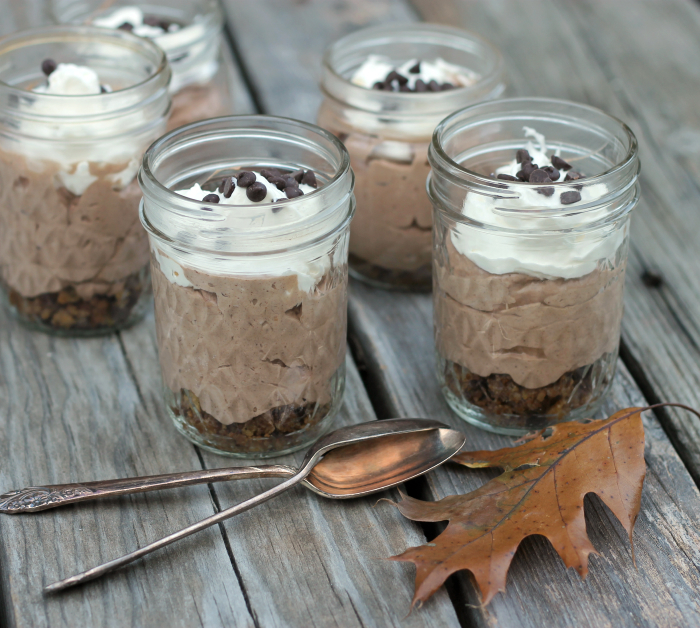 I love making desserts in jars for serving! So cute and great for making ahead of time. 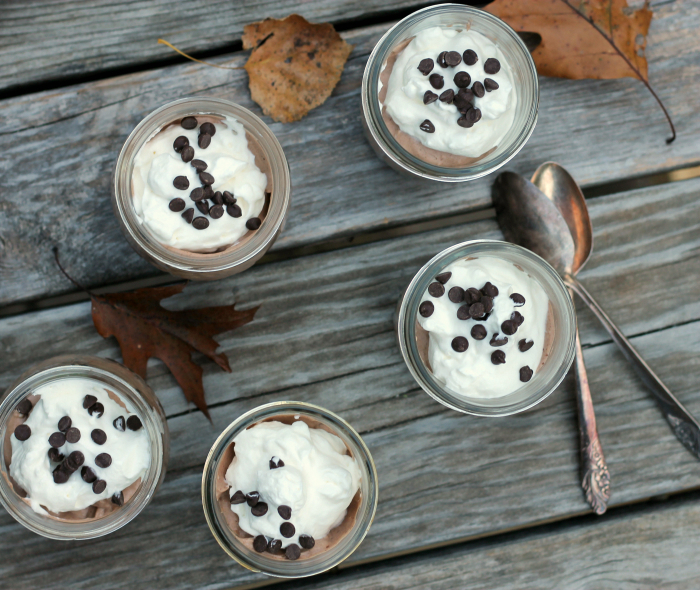 How many jars of mousse of you get with this recipe? I believe 5 to 7 jars, depending on how big your jars are. The jars I used were little jelly jars. Thank you for stopping by.